Do you have the “end of summer blues”, worrying about what you’ll pack in the kids’ lunches, how busy work will be, and how you’re going to juggle it all while maintaining your sanity? This guide will not only help you pack and prepare but get you excited for the fall season and out of that same-old sandwich rut. 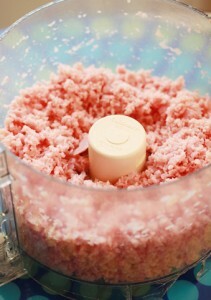 Make the sandwich fillings in your food processor the night before and use them for kids and parents alike! Kids love cute little finger sandwiches, that you can fill a million and one ways. Start with a good quality bread that contains little preservatives. Check the ingredient list for the worlds “whole” grain and look at for the whole grains council stamp. Then try one of these unique fillings that both kids and adults will enjoy. My granny used to make this for me growing up and I just loved the cute little shrimp she’d add to a creamy dressing: Mix 1 cup defrosted baby shrimp (also called salad shrimp), with a few tablespoons of mayo and plain yogurt, and 1/2 cup finely chopped celery, kale, or spinach. Add a dash of celery salt or garlic salt and mix well. Here’s another one of my granny’s favorite recipes, that I gave a little “skinny” twist: Blend in cauliflower to lower the fat and boost the nutrition! Place a 4-ounce hunk of cooked, nitrite-free ham in the food processor. Blend until finely chopped (as you see in the photo), transfer to a bowl then finely chop 1 cup of cauliflower florets or red cabbage, then transfer to the bowl with the ham. Stir in a few tablespoons of mayo and plain yogurt, and a tablespoon of pickle relish (or leave this out for “green haters”). Smoked salmon is rich in healthy omega-3 fatty acids and cream cheese helps to anchor it to bread. Slip in a few spinach leaves or salad greens for added nutrition and color. Combine 1/2 cup grated cheddar cheese, a tablespoon cream cheese, a teaspoon of Dijon mustard and a tablespoon of warm water in a blender. Blend until smooth. Pair this delicious spread with freshly sliced apples, roasted red pepper, or thinly sliced olives. While some kids can’t have peanut butter, almond butter maybe be a better butter option. Nuts are a wealth of nutrition and they taste great. To make these sandwich wedges, use a few tablespoons of good quality store-bought almond butter along with thinly sliced zucchini and soft avocado in a pita half. Slice into wedges and pack. If your child can take peanut butter to school and enjoys it, use it in place of almond butter as an option or try sunflower or cashew butter too. If your child can’t have any nuts at all, try the cheddar cheese spread above. Mix 4 tablespoons plain Greek yogurt, 1/2 teaspoon grated lemon zest and 1 tablespoon chopped scallions. Spread on white bread and sandwich with sliced cucumber. Trim the crusts and cut into pieces. Add a pinch of garlic salt, paprika, or freshly ground black pepper for grown-up tastes. Fill your bread with any of these fillings and cut into smaller squares or triangles. Transfer to an air-tight sandwich box. Any of these filings can also be used in a whole wheat or gluten-free wrap as well, cut into wedges or pinwheels. To make the fillings a complete lunch for mom of dad, fill a large air-tight container with salad greens and add a scoop of the ham or shrimp filling. Veggies are where the serious nutrition lies, but getting kids to gobble them up can be tricky. 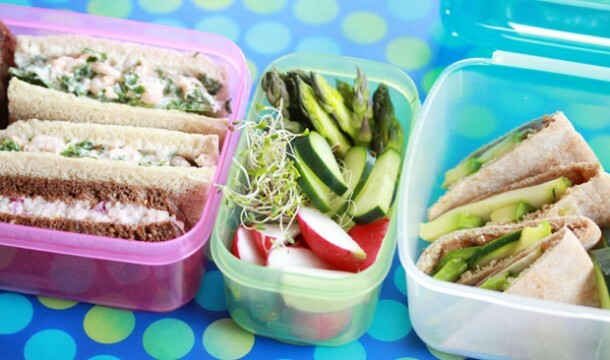 Try these fun and easy ways to pack veggie nibbles that are out of the ordinary. 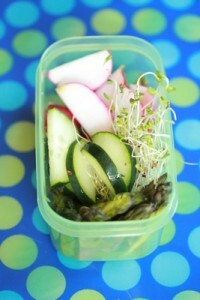 Raw veggies are fast to cut and easy to pack. Kids love colors, so offer a variety of color before you slice. Cut fresh veggies in small bites, to encourage kids to nibble or try something new. 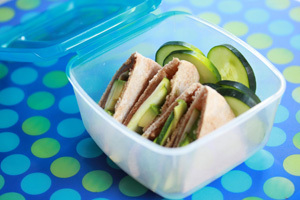 I like these mini-containers from Rubbermaid that are part of their “Lunch Blox” collection. They snap on top of sandwich boxes and even come with an ice pack that you can snap on. Store-bought veggie chips can be pricey but making them at home is a whole lot cheaper and super easy. If you own a dehydrator, dehydrating veggies is a marvelous way to turn a wide variety of veggies into tempting crisp chips. 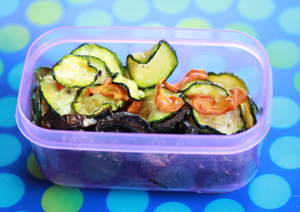 Try thinly sliced mushrooms, zucchini and yellow squash, carrots, and sweet potato. Leafy greens work particularly well and dehydrate up to 2 hours faster, like collars, Swiss chard and kale leaves. Use your dehydrator set to 135°F for about 5 hours or until crisp for higher moisture veg like zucchini (or lower the heat to the lowest setting and run it overnight). For leaves and mushrooms, 2-3 hours at 135°F works best . Mix and match your veggies for the best nutrition, for example carrots, zucchini, and kale for a mixed bag of chips. If you’re interested in checking one out, you can start with a decent brand like this Pro Food Dehydrator that is around $70. Before adding your thinly sliced veggies to the dehydrator, toss with a drizzle of olive oil and test out tempting flavorings like store-bought taco seasoning or make it homemade, Jane’s crazy mixed up salt, garlic salt, Montreal Steak seasoning — and if your kids are spice lovers try this delicious chipotle seasoning. For grown-up lunches, try tahini paste , miso paste, hot sauces or gourmet vinegars and healthy sauces.